Two brownie recipes within one week? Let me explain. Do you ever get in a funk? Ya know when everyone and everything pretty much annoys you for no apparent reason. Well, I have been in this funk for about a week and the only cure I could come up with was… chocolate. 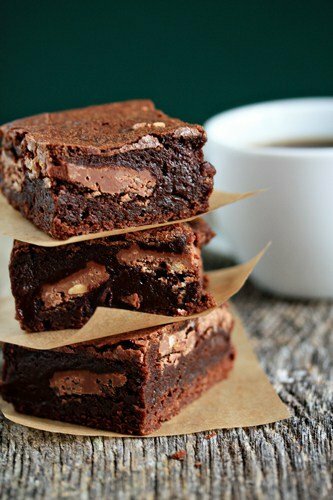 More specifically rich brownies with a milk chocolate toffee candy bar baked into the center. Yeah, Symphony Brownies will cure a mood like no other. If you frequent My Baking Addiction on a regular basis, you may recall that I’m not especially fond of chocolate, but there is something about these brownies that makes me swoon. I’m pretty certain that something is the ooey gooey center that is imparted by the Symphony candy bars. These Symphony Brownies couldn’t be easier and I’m guessing the only items you’ll have to pick up from the market are the Symphony candy bars. So, here’s to a good a week! Have a great day and thanks so much for stopping by! 2. Microwave chocolate and butter or margarine in large bowl at medium (50% power) for 3-4 minutes or until butter is melted. 3. Whisk until chocolate is melted. Stir in sugar and add in eggs, extracts and salt. Gradually add in flour and stir until just combined. 4. Spread 1/2 the batter into prepared pan. Add an even layer of Symphony Chocolate squares and cover with remaining 1/2 of brownie batter. Bake for 30-35 minutes; do not over bake. These look so good! My hubby used to buy me Symphony bars all the time when we were dating. Guess he thought chocolate was the key to my heart…he was probably right. These brownies look nice and fudgy too, just the way I like them! They look FABULOUS!! Love Symphony Bars. Have we been living dual realities this week? I think it was a full moon last night. The gooey centers of these brownies are calling me. :) Those are perfect- just like I like them. I LOVE Symphony Brownies!!! I haven’t made them in forever ~ thanks for the reminder! I’m going to make ’em this week! I’ve never had a Symphony Bar before, but these brownies look delicious! YUM! OMG these look so good! I can’t wait to try them. I love symphony bars and these just look delicious! A fabulous treat!! They look fabulous! Swoon indeed – these are wonderful. Nice to see you started with a scratch brownie recipe. Thanks so much for sharing. These look absolutely AMAZING… what a wonderful recipe!!! Oh my… brownies and symphony bars? You are speaking my language! Love! Oo you can never go wrong with chocolate enveloped in more chocolate!! This is my absolute favorite brownie! I make it more often than I should – it’s a no-fail favorite! I can’t resist a chewy yummy brownie. Looks so good, Jamie! These look great! I have made the Paula Deen recipe for a long time. It’s so delicious :) This also reminds me that I have three Symphony bars in my pantry. I gotta use them up! Oh my heavens! How did you know that I WAS IN A FUNK TOO!! Sooo, perfectly timed, I just can’t believe it! These look wonderful and hopefully will be in my mouth before bedtime tonight!! A funk? Oh, I’m so glad I’m not the only one! Your brownies look delicious and the photo is very beautiful, as always. Oh my, I’ve seen Paula Dean makes these numerous times and I alway think how I need to make them, but I never have. Yum, they look so good. Chocolate is definitely my go-to cure when I can’t figure out what else is wrong with me. I assume that it’s probably some hormonal imbalance that chocolate sets back on track. These sound and look amazing! OMG they look so chewy and delicious! You know what? I always see Symphony bars at the end of the check out line, and I’ve never had one. I guess I should check it out!! What is your trick for slicing perfect squares like in the picture? Mine always seem to fall apart..all the more crumbs for me to steal..but not so pretty! 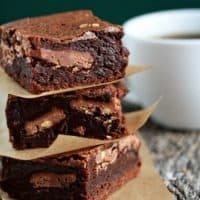 Chocolate can definitely cure all sorts of things, including, but not limited to funks :) I want to put myself in a funk just so I have an excuse to try these brownies! my brother LOVES Symphony bars and his birthday is tomorrow!!! i’m going to make him a cake but if i have time, i’ll make these brownies too! i’ve never had symphony bars but these look great! Oh girl do I ever know what you mean :) I could use a batch of these to get through the rest of my crazy week. Scrumptious!! Oh my!! I made these last week and they were really good. I’ve never had a Symphony bar, prior to making these–I’ve been missing out! I featured them on my blog–full credit to you. Thanks for the great recipe. I love symphony candy bar’s. Can’t wait to try this recipe! I have seen this recipe in one of my Paul Deen’s cookbooks, but have forgotten about it. Thanks for the reminder! yum yum yum!!! These look so good! I know of the funk you speak of. I think having 2 brownie posts this week is A ok! These brownies were amazing! I made them a few weeks back and everyone just about died :) I have a question though…I have a friend who is gluten-free, is there any way to make these into a gluten-free friendly brownie? Would coconut flour work do you think? Thanks for the amazing recipes–huge fan! Thank you so much! My friend and I prepared these brownies, and it was amazing! Brilliant recipe I made them for my boyfriend he was pleased when he tried them. So big big thanks for sharing the recipe. I would love to make these as they have the exact texture quality that my husband loves in a brownie…but I cannot locate Symphony bars here in France…What kind of candy bar is it? Is it similar to a Heath toffee type bar?..Would Daims or Ferrero Rocher…or anything else here come close? Any enlightenment from yourself or readers would be so very appreciated! Lovely post and bar! Hello again! …I just got a thought…could I possibly use TOBLERONE bars instead?…I live on the French/Swiss border..and these are everywhere! Since there are almond/toffee bits involved I think they might be a suitable substitution?…Thanking you for any opinion! Toblerone would be perfect! In fact, I’ve them in this exact recipe. Enjoy. WOW, these are INTENSE! I would advise grabbing some vanilla ice cream before you make these – I could barely eat them without it! Delicious though. Almost like a flourless chocolate cake or a chocolate souffle! I happened upon this recipe on Pinterest. I love it! I just made it for the 3rd time in 2 weeks, (once was for a class of kids, so my hips aren’t entirely hateful…lol,) I have no idea what Symphony bars are, I used a combination of Skor bits, white chocolate and semi sweet chocolate in the centre…the kids love it, I love it, Hubby loves it, all the teachers asked for the recipe…LOVE this recipe!!!! Thanks! I made these recently. I wanted to give some to my niece who just had a baby but I wanted to keep some too so I doubled the recipe. I bought extra symphony bars but didn’t need them. I baked them the 30 min. but they seemed to still be raw so I stuck them back in for another 5-10 minutes. The edges were somewhat more firm but the rest was still seemingly raw. I let them sit overnight but they didn’t firm up so I baked them some more – still the same. Anyway when I took them to my niece, she was so happy because she would prefer to eat the raw dough anyway! And I did enjoy them & so did my hubby. But is that how they are supposed to be or is it because I doubled it? I would probably make them again though! Deb, if you cooked them in one pan, it’s probably because you doubled it. Brownies are funny in terms of baking. They’re dense like a quick bread, but high in sugar like a cookie. It’s best to cook them one batch at a time.